Preheat the oven to 350°/180°C/Gas Mark 4. Make a horizontal slit in each chicken breast forming a pocket; take care not to cut all the way through the flesh. 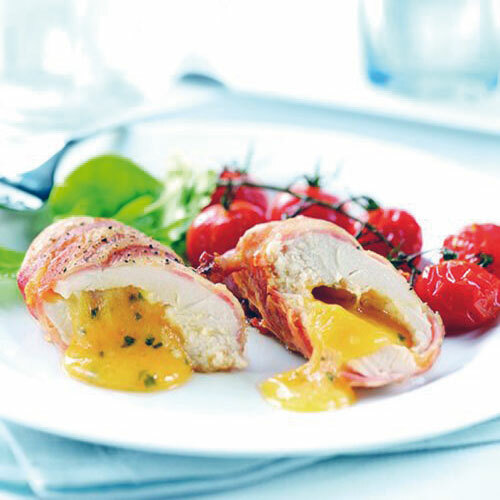 Cut the Double Gloucester cheese into 4 even sized pieces and place one in each pocket of the chicken along with a small sprinkle of rosemary and thyme. Stretch the bacon rashers with the back of a knife and wrap 2 rashers around each of the chicken breasts, securing firmly with a cocktail stick. Place in a roasting tin and season with a little freshly ground black pepper. Roast for 30 to 35 minutes until the bacon is crispy and the chicken is cooked through. To serve, remove the cocktail sticks and cut each chicken breast on the diagonal (take care as the filling will be very hot). Serve with some roasted cherry tomatoes and salad.